LONDON (Reuters) - Sterling weakened on Wednesday after data showed inflation fell more than expected in September and before a European Union summit at which Britain will try to unblock stalled negotiations for a Brexit deal. 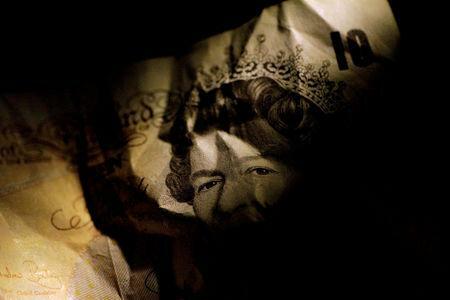 Economic data had briefly redirected traders' attention towards the British economy and away from Brexit this week after figures on Tuesday showed the strongest wage growth for workers in a decade. But weaker-than-expected consumer price inflation, which came in at an annual rate of 2.4 percent in September versus forecasts of 2.6 percent, pushed down a pound already weakened by a BBC report that Britain would not seek to extend the Brexit transition period. The pound has largely shrugged off a deterioration in the Brexit talks in recent days and remained calm, but traders say it remains at the mercy of the negotiations. "As important as the data is, the market is still focused on Brexit," said Neil Mellor, a strategist at BNY Mellon. The pound, trading down 0.3 percent at close to $1.3150 before the data was released, fell further and hit a day's low of $1.31, down more than half a percent on the day. Against the euro, sterling dropped to 88.06 pence, down 0.3 percent on the day before recovering as a broad dollar rally hit demand for euros. The Bank of England has said tighter monetary policy depends on Britain agreeing a trade deal with the EU. But it also wants to see signs of more wage growth, which could feed into inflation. BoE Deputy Governor Jon Cunliffe said on Wednesday this week's data does not yet show that wages are growing as strongly as the bank had predicted they would earlier this year. Nomura economist George Buckley said sustained faster wage growth should eventually lead to a faster pricing of interest rate increases. "With Brexit uncertainty high, the market won't price that immediately, but if wages maintain this momentum, a sharp upward shift in rates pricing will follow in due course, we think," he wrote in a note to clients. Money markets are not fully pricing in a 25 basis-point increase by the BoE until November 2019. EU leaders are set to give Prime Minister Theresa May a tough reception in Brussels, warning her to rally support at home for the Brexit deal on offer or be cut loose without one in March. "If you start to get economic data seriously out of line with expectations you should get some big moves (in sterling)," BNY Mellon's Mellor said. "But at the moment it's a case of spinning plates."